Manx Radio are once again proud to be the official media partner for Theatrefest 2016 and will be working in Association with the Arts Council to promote the festival. 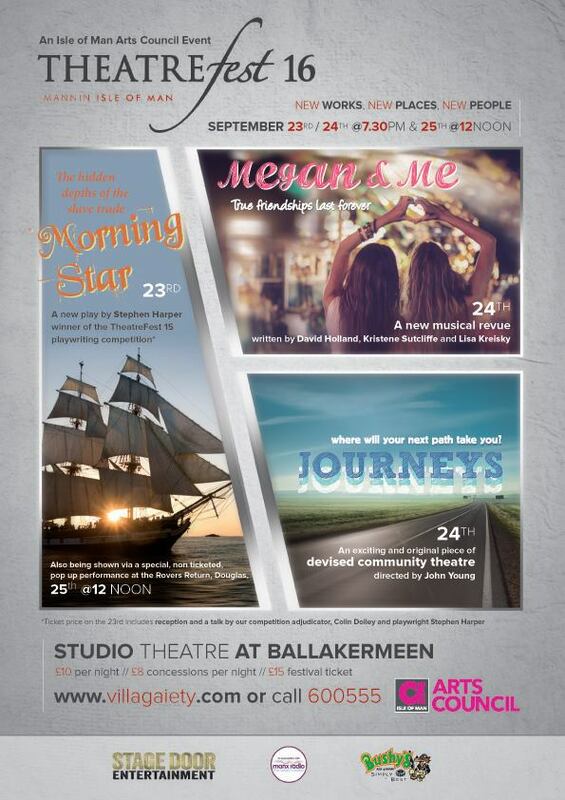 Taking place from the 23rd to the 25th of September' TheatreFest will be back with three brand new performances at the Studio Theatre at Ballakermeen. On the 23rd September the winner of the TheatreFest '15 playwriting competition Stephen Harper will debut his winning play 'Morning Star'. A period play based around the slave trade in 1848 the piece captures an authentic atmosphere of the time and the harsh reality of slavery but still engages with the audience. Morning Star will return for a unique non-ticketed pop up performance in the Rovers Return pub on the 25th September. 'Megan and Me' a new piece of musical theatre written by David Holland, Kristene Sutcliffe and Lisa Kriesky will be performed on the 24th September as part of a double bill with an original devised piece of theatre 'Journeys'. Megan and Me explores the friendship between two women through their entire lives and Journeys will be directed by John Young with the aim of creating an original piece of contemporary work in just one week! Tickets start at a per night price of £10 with £8 concession tickets available. There's also a festival ticket at £15 which covers entry for both 'Morning Star' and the Megan and Me/Journeys double bill. Tickets can be bought online by clicking here or from the Villa Marina box office and the Isle of Man welcome centre.